Randall Monk has been studying self-improvement, spirituality and metaphysics since the early 70’s. He is the creator in collaboration with Ronna Herman Vezane of Becoming an Alpha Master, an audio program containing sacred breathing techniques and meditations provided by Archangel Michael. He works closely with Ronna, enthusiastically sharing Michael’s wisdom teachings as well as the wisdom of his Lord Melchizedek lineage. As a Memory Seed Crystal Activator, Randall works closely with a group of angels and special, encoded Seed Crystals. He also performs personal activations with individuals normally at sacred sites. Mt. Shasta: At Mt. Shasta we spend time at specific locations on the mountain and in the general area participating in activations and guided and personal meditations. Sacred site tours at Mt. Shasta can be tailored to individual groups. Normally the tours are from 1 to 4 days. Grimes Point and Pyramid Lake: This is a one-day excursion where we will visit two sacred sites in the Reno, Nevada area – Grimes Point and Pyramid Lake. 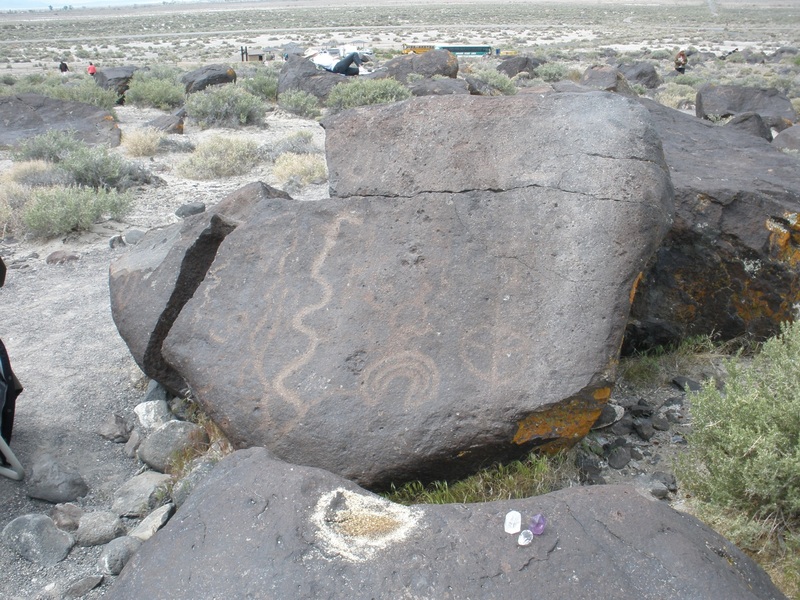 Grimes Point is an ancient site with caves and petroglyphs near Fallon, Nevada. Pyramid Lake is a sacred lake on Paiute tribal land. We will perform sacred ceremony at both locations and you will have individual time as well. The photograph above taken at Grimes Point shows a portal with a fifth-dimensional pyramid within it. Lake Tahoe: At Lake Tahoe, we spend time at a few select locations performing sacred ceremony and enjoying the beautiful scenery. The energy exchange for tours varies depending on the number of people and expenses involved. I host tours from time to time especially after a seminar in the area. However, I also provide custom tours for groups. Please contact me at RTMonk@gmail.com to arrange a custom tour. For sacred site tour information contact Randall at RTMonk@gmail.com.